For the first ten years of my life and sporadically in my teen years, summer holidays were at Margate: my mother's family lived there and this was our only chance to see that half of my relatives. It was just as well that it happened to be a holiday resort! I have very fond memories of the place as it was them, fifty to sixty years ago, and a rather less fond memory of a visit made a few years ago when my daughter was studying in Canterbury. We had heard that Margate was improving again and wanted to make another visit to see if we could feel better about the place, and when a day trip to Canterbury on family business came up, we made it two days, staying in Canterbury and tripping out to Margate the first day, family business on the second. It was fairly short notice but through the Virgin Trains East Coast website I was able to book First Class tickets Peterborough - Canterbury and return at really good prices: there are no classes on the Southeastern High Speed service from St Pancras to Canterbury so there is no First-Class mark-up for that section of the trip but we did have all the advantages of First Class on the East Coast section, adding standard tickets for the Stamford-Peterborough and back section. 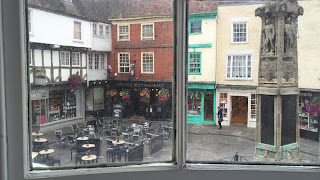 Hotel rooms for the two nights in Canterbury were fairly scarce but I found a hotel right next to Canterbury Cathedral which I just had to hope would be OK.
We left Stamford on a Thursday evening after our day's tasks and made our connection at Peterborough for London. I had only allowed a few minutes this time because it was late in the day and we needed to get there reasonably quickly. It worked like a dream and by the time we'd eaten our sandwiches and cake and drunk our wine and coffee we were at Kings Cross. When I was little, a journey to Margate then involved crossing London to Victoria station and taking a rather slow electric train out through the south-eastern suburbs, but things have changed. The opening of High Speed 1, the line to Ashford built to take fast trains to and from France and Belgium, has enabled fast domestic service in Kent to operate in and out of London St Pancras International. So we made our way off the platform at Kings Cross, turned right onto the main concourse and strolled round to the Southeastern platforms at St Pancras. We had plenty of time here and, as we often seem to do, spent a little time in the shops at St Pancras and then went upstairs to the little concourse just before the platform was announced. We were among the first to board the train and it was as well that we were in good time for it loaded heavily and a few people in our coach did not get seats. Under way from St Pancras on time, the train tunnels under London and emerges for a brief stop at Stratford International and then tunnels again for the scruffy all-powerlines-scrapyards-and-highways landscape of north Thameside before tunnelling under the river itself and emerging in Kent for a stop at Ebbsfleet: currently just a station but to become a "garden city" new town, apparently. Speeding through Kent, we stopped at Ashford where we left the high-speed route and joined what had been a minor line to Canterbury where there was a clue to the crowds on our train as it made three unscheduled stops - I speculated that a local train in that direction must have been cancelled and the extra stops had been included so that passengers could use this one instead. We were soon in Canterbury, just a few minutes late owing to the extra stops, and walked off to our hotel, a bit of a walk but with wheeled cases this really is not a problem. We had come to know the city quite well over the years of our daughter's student life and knew the way, although I could not picture the hotel in my mind. I hoped it would be comfortable. As happens sometimes in city centres (our hotel in Edinburgh, for example), only the front door of the Cathedral Gate Hotel is at street level: inside were stairs leading up to reception on the first floor. Retracting the dragging handles of our cases we carried them up to the counter and checked in with a young man who took our payment, handed us our keys and led us to our room. On the way through the narrow corridors of this obviously medieval building he showed us the roof garden which had a spectacular view of the cathedral, by now floodlit against a dark sky. If our schedule were not already full I could imagine us quaffing wine out here on a warm August evening, for there was also a small bar. After the roof garden we were led, alarmingly, out onto another roof (flat roof, of course!) and across to another building where our room was located: I began to wonder if I had booked the right place, but once through the door the other side it was clear that this was the better part of the hotel for it had recently been redecorated and recarpeted. Our room was beyond the very comfortable lounge and also had a cathedral view. It was a very well-appointed room with a four-poster bed and we had a great night's sleep. Breakfast was continental with a paid option of a cooked English breakfast and we really did not feel we needed more than the included continental offering. Excellent croissants baked fresh and the freshest fresh fruit salad imaginable, and waiter-served, too. 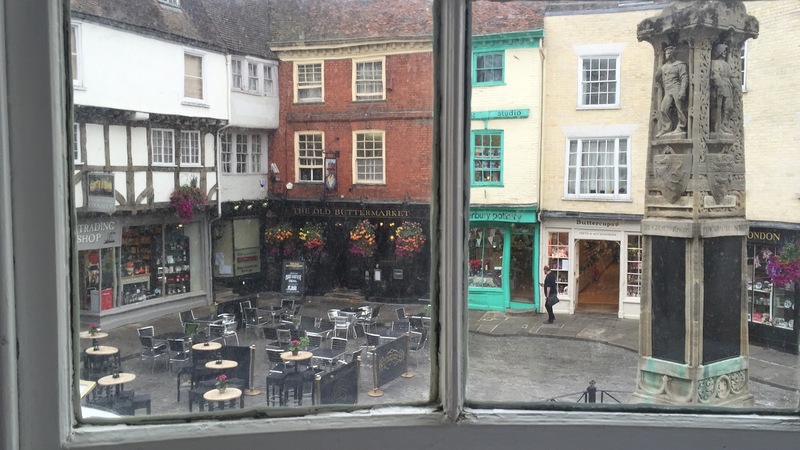 We managed to find a table in the bow window overlooking the Buttermarket: just perfect (and it was available the second day, too!). After breakfast we rushed to the station for the train to Margate, not quite having taken in how long it would take to get there and buy our day return tickets! It was a short, quick trip via Ramsgate and we emerged at the station in Margate just as I remembered it from all those decades ago. The high ceiling of the ballroom-like booking hall was peeling a bit and needed attention but it still spoke of arrival at an important place. We started at Dreamland which had been a waste ground when I last saw it, following a disastrous fire which had destroyed the Scenic Railway, the world's oldest wooden rollercoaster. Admission to Dreamland, now reopened as a retro theme park with antique rides and entertainments, was free of charge and we wandered around looking at what was on offer. The Scenic Railway had been completely rebuilt as a centrepiece of the park but not much else was as I remembered it, having changed a lot over the years and having been closed for a while before the fire. Regrettably the Scenic Railway was not operating when we visited or I would definitely have ridden it for old times' sake. 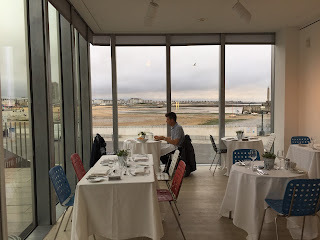 We walked along Marine Parade and visited the Turner Contemporary gallery. This does not have a permanent display but stages exhibitions through the year, the current one being "Seeing Round Corners" on the theme of the circle in art. There was one Turner among them - they always include at least one of his works in each exhibition. The gallery is apparently built on the site of the house where he stayed on his request visits to Margate. We had coffee at the gallery cafe and wires impressed that we booked a table for dinner, which they now offer on Friday and Saturday evenings. On our walk we went along the road where I used to stay in a boarding house on those childhood holidays, lined with dozens of similar premises. None was still trading and most of the houses were in multiple occupation now. Some were being refurbished as individual dwellings again or as proper flats but none looked like it would again be offering bed & breakfast. I remembered these streets gaily lit with strings of coloured lights, too, all of which were long gone. How I wish I had taken photographs, but it was before my photography days. We caught a bus to Birchington looking for other family connections and found another place very changed, with the beach totally deserted, not only by people but even by the sand! There was no longer anything to attract people here, although it remained a very pleasant village and we spend a little time in the library looking at what it had been and at the pub for refreshment before catching the bus back to Margate and dinner at the Turner Contemporary, which was excellent (Trip Advisor review already published: see links in right column). Those of us used to seeing trains of green slam-door coaches find it an incongruous sight to see the streamlined Javelin trains at Margate station! This is one way that the place has improved since the 1950s, fast trains from St Pancras operate two different routes terminating here: one via the north coast and Medway towns, leaving HS1 at Ebbsfleet and the one we needed via Canterbury, leaving HS1 at Ashford. We were soon back in our hotel and another good night's sleep. Our family celebration in Canterbury on the Saturday finished with a lunch of fantastic value at the Foundry Brew Pub, well worth looking at, not just for beer and food, but a decent wine list and cocktails, too. Again, see my Trip Advisor review. Then we were on the train back to London, this time involving a change at Ashford, for not every Javelin comes through to Canterbury and there are local trains connecting at Ashford, then across the road and a short wait in the First Class lounge at Kings Cross before the train home. We shall have to return for another exhibition at the Turner Contemporary and to see how the renovation and rehabilitation of Margate is coming along: it is now quite feasible as a day trip from Stamford, albeit not involving dinner at the gallery.